“It is National Diabetes Week from 9-15 July and Diabetes Australia’s “It’s About Time” campaign aims to raise awareness about the importance of early detection and early treatment for all types of diabetes. It’s About Time we detected all types of diabetes earlier and save lives. 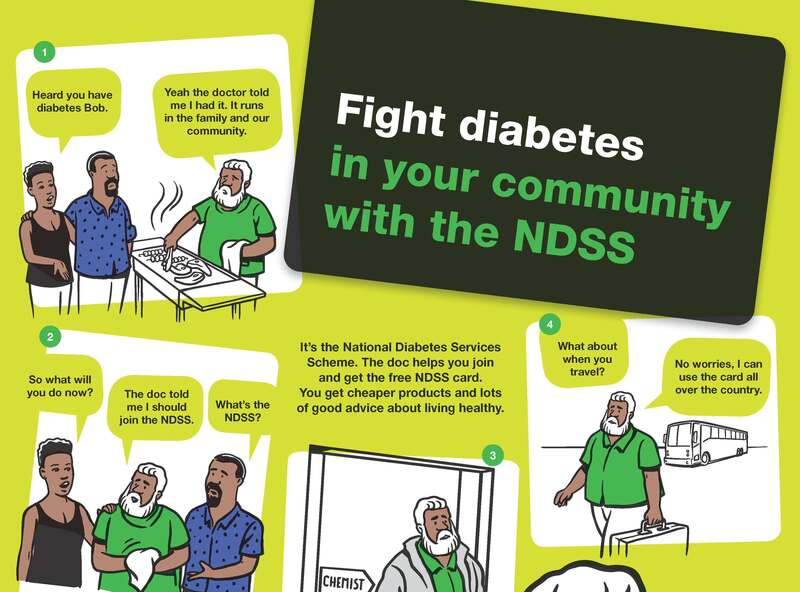 Aboriginal and Torres Strait Islander people are almost four times more likely than non-Indigenous Australians to have diabetes or pre-diabetes. ” New research has found that only 5% of Australians aged over 40 have had a type 2 diabetes risk check in the past two years. Also, more than half of people surveyed were unable name any diabetes related complication despite type 2 diabetes being a leading cause of vision loss, kidney damage, heart attacks, stroke and limb amputation. 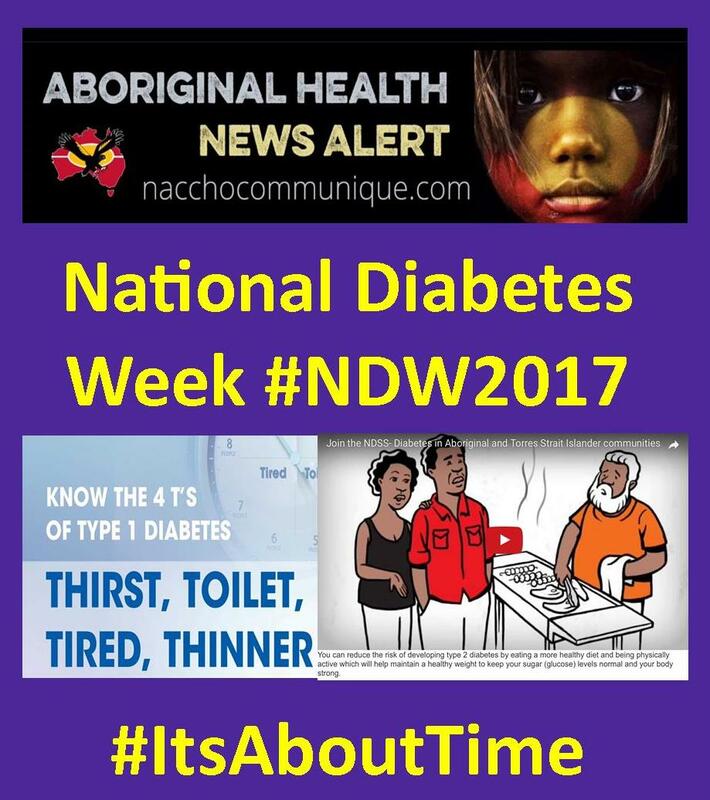 The following information is from the ‘Keep Culture Life & Family Strong; Know Early About Diabetes’ flipcharts for Indigenous Australians. It is of a general nature only and should not be substituted for medical advice or used to alter medical therapy. It does not replace consultations with qualified healthcare professionals to meet your individual medical needs. To help the sugar (glucose) move into your muscles and body cells your body needs something called insulin. Insulin is made in the pancreas – a body part which is near your stomach. Talk to your doctor, clinic, nurse or health worker about having a test to find out if you have diabetes. You can’t always feel it or see it happening, so you might not know you have it. New research has found that only 5% of Australians aged over 40 have had a type 2 diabetes risk check in the past two years. The release of the research comes at the start of National Diabetes Week as Diabetes Australia launches a new campaign, It’s About Time, to raise awareness of the seriousness of the type 2 diabetes, and urge 500,000 Australians who could have undiagnosed type 2 diabetes to get checked. Diabetes Australia CEO Professor Greg Johnson said there was great concern about the length of time many people have silent, undiagnosed type 2 diabetes without it being diagnosed. “It’s about time we detected silent undiagnosed type 2 diabetes. Many people have type 2 diabetes for up to seven years before being diagnosed and during that time up to half begin to develop a diabetes-related complication,” Professor Johnson said. “The tragedy is that much of the damage to the body that causes diabetes-related complications like vision loss, kidney damage, heart attack, stroke and limb amputation is preventable. “AUSDRISK is a free, online risk assessment you can take to determine your risk of type 2 diabetes. Despite over 60% of Australians having risk factors for type 2 diabetes, the research shows only 5% of Australians over the age of 40 have done the type 2 diabetes risk assessment in past two years” he said.  More than 51% of people over the age of 18 were unable to name any serious diabetes-related complication despite type 2 diabetes being a leading cause of vision loss and blindness, limb amputation, kidney damage, heart attacks and stroke. Diabetes NSW & ACT CEO Sturt Eastwood urged people take the free type 2 diabetes risk assessment today. “Type 2 diabetes is the single biggest challenge confronting Australia’s health system and it’s time we did a better job of detecting type 2 diabetes earlier,” Mr Eastwood said. “The earlier a diagnosis of type 2 diabetes occurs, the sooner a management plan can be put in place delivering better outcomes for the individual and the community. “The AUSDRISK check only takes about five minutes. If you take the check and get a high score, see your doctor so they can determine if you have type 2 diabetes. Professor Lesley Campbell from St. Vincent’s Hospital said front line health professionals were spending more and more time treating patients who present with type 2 diabetes complications. Diabetes was often still undiagnosed until admission for heart attack, stroke or lung or heart transplantation. “Unfortunately we are seeing people with type 2 diabetes diagnosed too late and the impact of late diagnosis and lack of treatment is filling our hospital beds,” Professor Campbell said. “Diabetes is ranked in the top ten causes of death in Australia and is the leading cause of preventable blindness, limb amputation and end stage kidney disease. For Sydney woman Belinda Nakauta, having her toe amputated because of type 2 diabetes was a major wake up call. “I went to the doctor about a urinary tract infection and he suggested I get checked for type 2 diabetes. I was shocked when it came back positive and the scary thing is I have no idea about how long I was living with type 2 diabetes before I was assessed,” Ms Nakauta said. “Having a toe amputated a couple of years ago was a wakeup call. Having a part of your body cut off, no matter how small, is a scary experience. With the help of a dietitian and regular gym visits, I’ve lost more than 20 kilograms and dramatically cut back on the medication I need to manage my type 2 diabetes. “I wish I had done something five or ten years ago. I don’t want to be that person in the ICU on dialysis. I don’t want to have foot complications or lose my eye sight. I don’t want to be that person.